The product development in the bike sector does spare no-one. 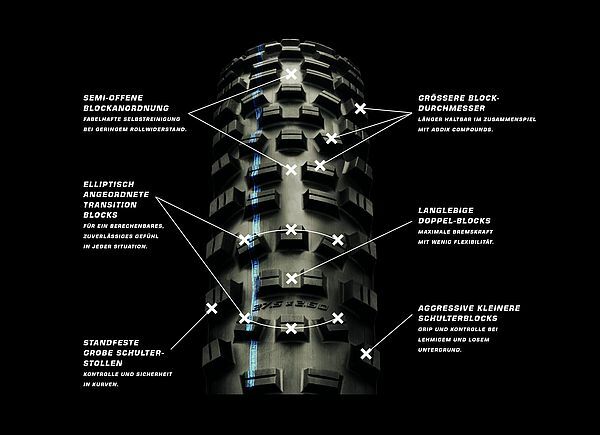 As a result, Schwalbe used the 25th FSA BIKE Festival Garda Trentino to present the legendary and refined Enduro tyre Hans Dampf. The brand new and radical profile is – as proclaimed by the manufacturer – expected to herald the start of a new era thanks to the combination with the well-established ADDIX COMPOUNDS. For all wheel sizes (24'', 26''. 27.5'' and 29'') and widths up to 2.80. A semi-open arrangement of the blocks which also boast a bigger diameter makes sure that the product lasts longer. Aggressive, smaller shoulder blocks ensure a better grip and control on muddy and more loose surfaces. 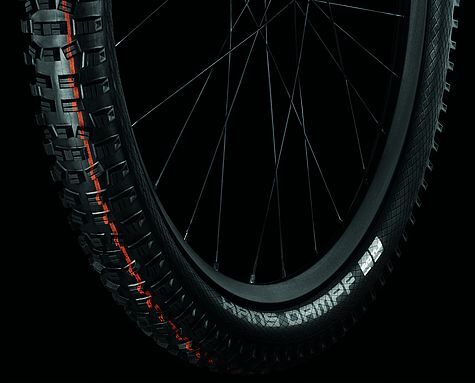 Thanks to a better stability Hans Dampf is supposed to be the ideal companion for everyone who loves to ride single tracks, curves, tables or kickers. And as it's available in extreme width, the tyre might become the new favourite in the eMTB scene, too.